Movies about the drug cartel are a dime a dozen, probing the necessary fields of law enforcement / individuals in the shady back-door dealings of money laundering, drugs, kingpins, and the violent acts that go along with this dangerous business. These movies usually cater to a certain crowd of movie “viewers” as the movies are generally “R-rated”, showcasing the gritty “real life” criminal underworld that’s cinematically presented under a dramatic lens. There’s been wide range of these types of films, including Scarface, Blow, Traffic, Sicario, Bad Boys, and Once Upon a Time in Mexico to name a few. Now director Brad Furman debuts the next crime drama on the cartels in the movie The Infiltrator, a featured that’s based on a true story. Does this film find its genre’s suspense (and follow the money) or does it get lost within the cartel’s violent world? A devoted DEA agent working the streets of Tampa circa 1985, Robert Mazur (Bryan Cranston) is frustrated with several attempts to disrupt drug shipments coming from South America, taking his work’s anxiety home to his wife Evelyn (Juliet Aubrey) and their two kids. Handed an opportunity from fellow DEA agent Emir Abreu (John Leguizamo) to destroy the trail of dirty money that’s coming into Florida, Robert goes undercover as an ace launderer (under the alias name of Bob Musella), who’s capable of protecting the cartel’s cash. Partnered with Kathy Ertz (Diane Kruger), a fellow, but “green” agent who possess as Musella’s trophy wife, Robert goes deeper in this dangerous world of the drug cartel, making connections with vile men charge of keeping cocaine in supply, paying a singular interest in the cartel’s bigshot Roberto Alcaino (Benjamin Bratt), who’s employed by notorious drug kingpin Pablo Escobar. As things progress, Robert gets in way over his head as he gets entangled within perilous situations, slowly piecing together a case that could potentially ruin the cartel’s infrastructure by eliminating its key players. But at what cost? Since I watch a lot of movies, I’ve seeing plenty of movies that involve drug trafficking and / or the drug cartel. Basically all the movies that I’ve described up to, I’ve seen (plenty of times). Drug Cartel / crime dramas aren’t usually favorite type of films to watch, but, for the most part, they’re pretty good and peak my interest to take a look at a few of them from time and time again. I remember seeing the trailer for The Infiltrator and, in truth, was only have half-interested in seeing this movie. It actually wasn’t playing at my local theater that I usually go to and I really didn’t want to go out of my way to see. However, after seeing the movie and being slightly persuaded by my fellow blogger (Keithlovesmovies) I would say that I was going to miss out on watching a solid crime drama feature. In short, despite some problems, The Infiltrator is worth watching. Based on Robert Mazur’s biography memoir “The Infiltrator: My Secret Life Inside the Dirty Banks Behind Pablo Escobar’s Medellin Cartel”, the movie (The Infiltrator) is directed by Brad Furman, who previously directed such film as Lincoln Lawyer and Runner, Runner. Furman’s retelling of Mazur’s story (through a cinematic lens) is an engaging one. It takes a bit to get going, but the film’s story becomes very interesting, catapulting Mazur’s Musella into the heart of Escobar’s crime ring with all of his key players having interactions with Robert. Aesthetically, the movie is presented with a pleasing appeal as Furman’s The Infiltrator is a very well-made / crafted feature. Cinematographer Joshua Reis delivers some slick and appropriate camera shots, capturing the sleazy world of the 1980’s drug crime world. In conjunction with that, the film’s production design by Crispian Sallis and the costume designs by Dinah Collin follow a similar path, immersing audiences in the styles and feel of the drug syndicate crime ring in 80’s Florida. Perhaps the biggest problem in The Infiltrator lies within its narrative of its own genre. While the film is based on a true story on Mazur’s account, the movie unfolds as a slow burner, which isn’t bad, but the movie is a little long in the tooth, with a runtime of 2 hours and 7 minutes. It might not seem that long, but a couple of scenes drag and create pacing issues here and there. Also, and I’m sure the Mazur’s memoir does this, the movie doesn’t completely show the fully psychological extent that consumes him as he goes deeper uncover. It’s basically more of a story drama rather than a character study piece. In addition, the movie does also follow the common clichés and standardized troupes that are commonly used throughout similar narratives about undercover cops’ / drug trafficking. So, in a sense, the film falls prey to the crime drama formula, with familiar plot beats (albeit some good ones) that have been done multiple times over. In short, while the story is interesting, The Infiltrator doesn’t bring anything “new” to the table. One of the greatest strengths of The Infiltrator is within its casting. Leading the charge is actor Bryan Cranston, famous for his role in the hit TV show Breaking Bad, as Robert Mazur. 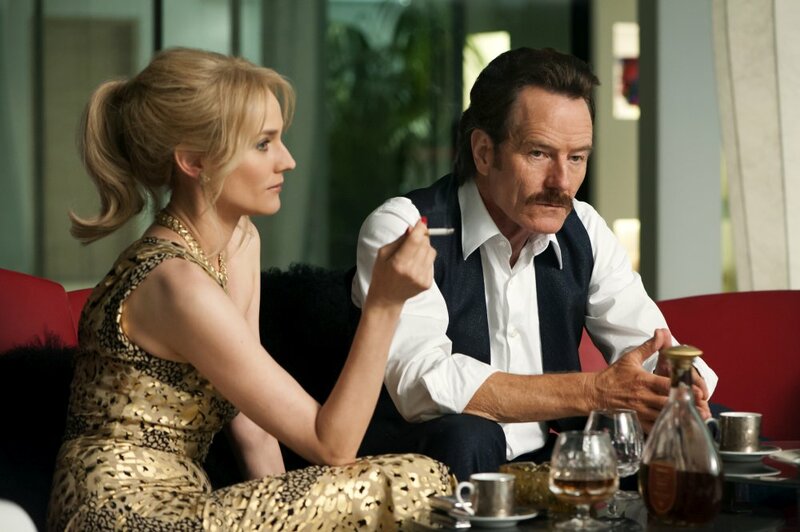 Cranston easily slides into the role of Mazur, playing that no-nonsense manner and vulnerable “family man” that seems to collocate with the immoral roles that he must play for his job as (the character of Mazur) is in a constant flux of balancing his two worlds. Like I said above, the movie could’ve explored a little bit more on Robert’s psychological toil on this whole situation, but (because of Cranston’s solid performance) what is presented suffices. As his co-star, for the latter half of the film, Diane Kruger is great as the Kathy Ertz, a “virgin” field agent who is intellectually capable at handling herself (and sometimes carrying Robert) through the criminal world. Another co-star, to both (but more towards Cranston) is John Leguizamo’s character Emir Abreu. This character proves to be foil to Cranston’s Mazur as Leguizamo’s eccentric energy channels with Emir, a character who rather enjoys the line of work as an undercover agent. 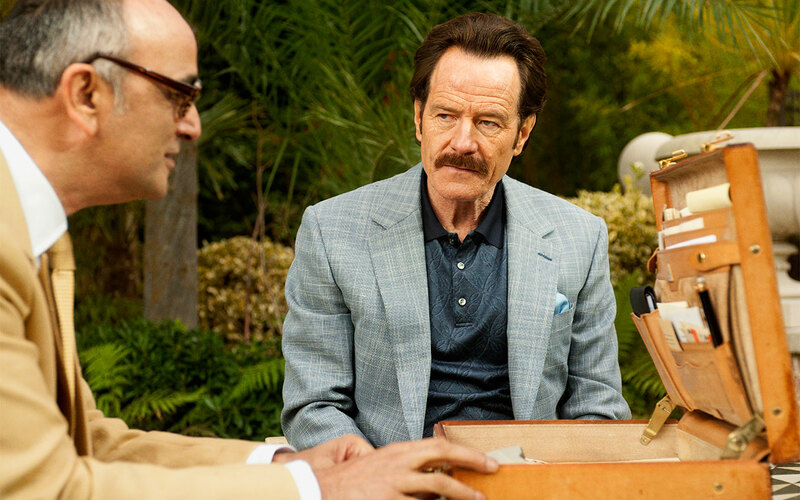 Robert Mazur follows the money and the dangers that go along with going undercover in the new movie The Infiltrator. Furman’s latest film is a very stylish and crafted feature film, delving into the violent world of the drug cartel with an intriguing plot and some great cast of characters. Unfortunately, the movie doesn’t break that much of “new ground” in the genre, playing to the well-known standard formula and troupes of these narratives into its three arc storytelling. Still, I actually did like this movie. Yes, it follows a similar path of its own movie genre, but, for what it’s worth, it was still a solid movie that entertained me. I would recommend the movie to fans who like “undercover” tales / crime dramas or to those who like well-made films with some great acting. At the very least, The Infiltrator showcases (cinematically) the dangerous life of an undercover agent and the intrinsic weavings of a drug cartel organization from the low-level grunts to the elite power players. Great review. I am really looking forward to seeing this one. Even though it does not break any “new grounds”, I am sure fans of that type of films will be glued to this one.